1. The limitations (i.e., ludicrousness) of AD&D's alignment system. Zeus (and most of the other gods) is Chaotic Good!? WTF? LMAO! "Chaotic" I'll buy; but "Good"? Well, if we define "good" in terms of a Bronze Age warrior ethos, I suppose - as head of the pantheon - Zeus is "good" but that's a distinction I don't think most AD&D campaigns made (or make). I prefer Green Ronin's system of "allegiances" - people, groups or ethical systems a character supports. 2. Achilles, the unstoppable engine of wanton destruction who - alone - cowed all the armies of Troy, is only a 15th level fighter!? And Neutral Good! Again: "Neutral," maybe; "Good," no. 3. Odd choices about who they decided to include: Coeus? Crius? Antaeus? If I had known more about Greek mythology at the time I might have wondered about the absence of Medea (they included Circe) or more heroes from the Trojan War (why not include Achilles' nemesis, Hector?). 4. The artwork (for the Olympian chapter, if not elsewhere, cf., the Cthulhu chapter, esp. p. 48) was pretty good (and, like Jason mentions in his review, young boys could always drool over the pictures of naked love goddesses (see p. 64, for my money that Aphrodite is a heck of a lot sexier than the third edition's version even if that one's in color; or the picture of the Central American goddess of vice, Tlazolteotl, displaying her nubile body to a couple of warriors, one of whom looks very interested, p. 36)). 5. Speaking of artwork, the third edition's is of better quality but often doesn't look quite...right. They did a good job with Ares, Demeter, Heracles and Hera but Apollo has some weird helmet thing going on, Athena's breast plates look...um...ridiculous*, Tyche looks like Counselor Troi from The Next Generation and the Cyclops looks like the cyclops from the movie Krull; I've already mentioned Aphrodite. And, jumping pantheons, third edition's Loki looks a lot like Jean-Luc Picard. What's up with that? 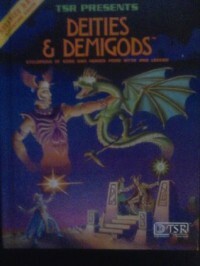 A bit more seriously and more broadly speaking, Deities & Demigods, whichever edition you read, is a reference book for a role-playing game not a reference for a serious study of mythology. And in its proper role, it's pretty cool, fully deserving of the 4 stars I gave it. And it did introduce me to Finnish, Chinese and Native American mythology, which was a good thing. * In the artist's defense, though largish, Athena's breasts are well within human dimensions, unlike a lot of fantasy women. In fact, a lot of third edition's artwork is rather tastefully done. A minimum of chainmail bikinis.